A household groups contacts belonging to the same family, providing a consolidated view of the family's finances. Households are created automatically when you create key relations between contacts (we go over that in our Key Relations lesson). You can do a "blank" household search to display all of the households in your database. In the Search box, click the drop-down list and select People & Companies > Household. Press the Enter key. 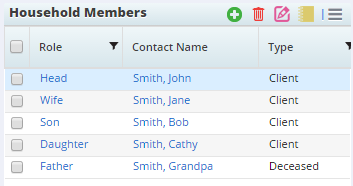 The Household List displays all households in the database. In the Household List, click the name of a household in the first column to open the record. Tip: When you open a household record, SmartOffice takes you to the Detail content link under the Household tab. The Detail content link contains basic information, including a list of household members. Click the Letters/Documents content link to see all letters and documents associated with household members. Click the Activity Log tab to see a list of calendar activities associated with household members. Here, you can see which household member you last met with. Locate the Household Members section. This is where you add, delete and manage household members. Click the link in the first column for the household member you want to view (in the example above, you would click Son to view Bob Smith's household record). The Household Member Details dialog box opens. Note: In SmartOffice, contacts can belong to more than one household. The This is the Primary Household of Contact box indicates whether this is the contact's primary household. Only one household can be a contact's primary household. Tip: You can click the household member's name to view information from his or her contact record.